Showing items in category Cook Islands, sorted by newest listed first. 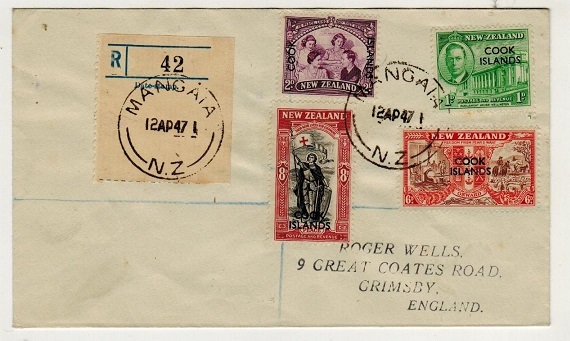 COOK ISLANDS - 1939 underpaid 'COLLECT/AFFIX STAMPS' maritime cover to UK used on M.V.MATUA. 1939 (JAN.7.) 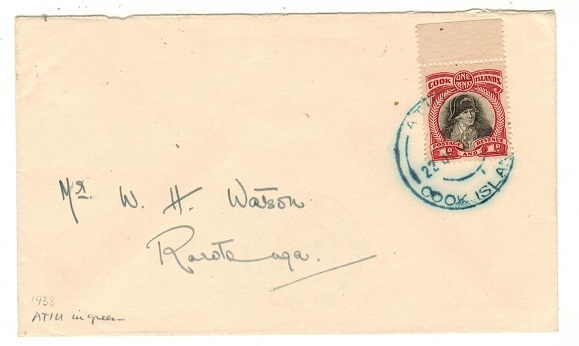 cover addressed to UK marked 'Via Rarotonga' and struck at lower left by green circular PURSERS OFFICE/M.V.MATUA maritime handstamp. 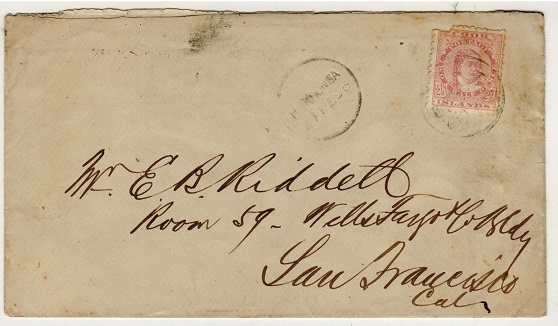 On arrival the cover was struck by scarce COLLECT/AFFIX STAMPS/FOR THE /DELIVERY tax mark with '1/1d' inserted in manuscript. A Cook Island 1d adhesive was applied and cancelled RAROTONGA. COOK ISLANDS - 1940 1 1/2d rate cover to Australia used at MITIARO. 1940 (14.9.) cover addressed to Australia bearing 1d adhesive tied in combination with New Zealand 1/2d green 'Centennial' adhesive by MITIARO/COOK ISLAND cds's. An unusual combination use. COOK ISLANDS - 1945 'TO PAY' cover to USA used at RAROTONGA. 1945 (AP.9.) 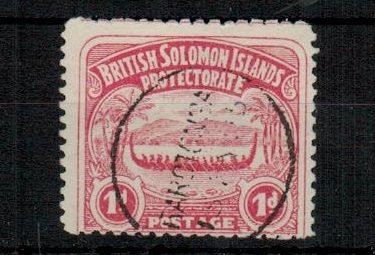 cover addressed to USA bearing 1d,2d,6d and 1/- 'pictorial' adhesives tied in combination with the 3d surcharge issue and tied by large ringed RAROTONGA cds's. The cover apparently under paid with black TO PAY/CENTIMES strike applied below with '480' added in blue manuscript. 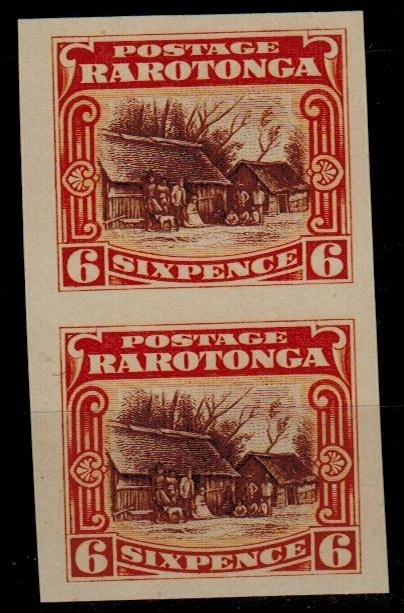 COOK ISLANDS - 1946 use of NZ 'Formula' letter card at RAROTONGA. 1946 (DE.13.) 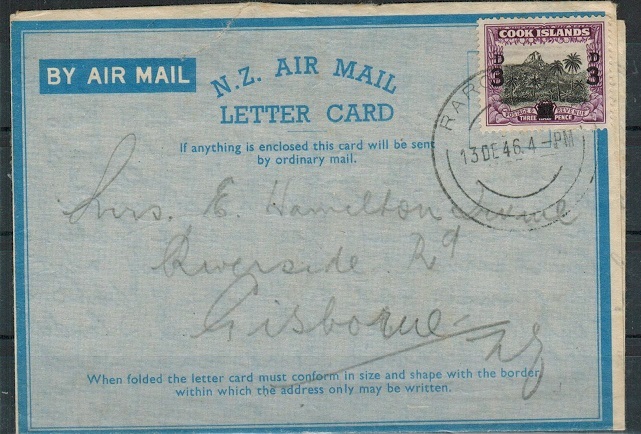 use of blue on blue (cream inlay) N.Z.AIR MAIL/LETTER CARD 'Formula' type stationery addressed to Gisborne in New Zealand (long genuine message) bearing 3d on 1 1/2d surcharge adhesive tied RAROTONGA. There was no airmail service at this time and it would have been treated as a letter and carged at 3d and sent by surface mail. A scarce use of this FORMULA stationery in Cook Islands. COOK ISLANDS - 1938 1d rate local cover used at ATIU and struck in greenish blue ink. 1938 (JE.22.) cover addressed locally to Rarotonga bearing 1d 'pictorial' adhesive tied by scarce ATIU/COOK ISLANDS cds struck in greenish-blue ink. COOK ISLANDS - 1933 2 1/2d rate PAQUET BOAT cover to USA. 1933 (DEC.25.) 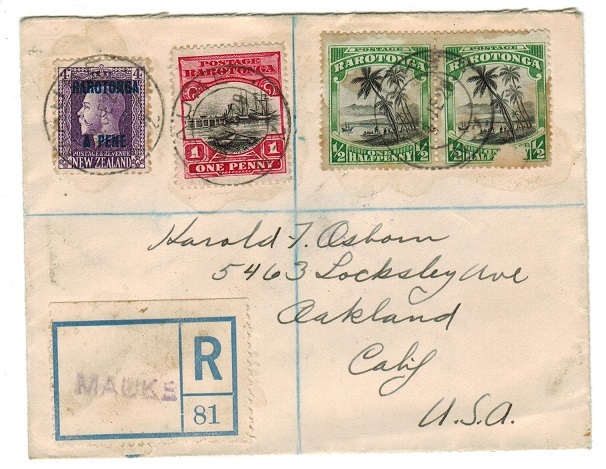 cover addressed to USA bearing 2 1/2d adhesive tied by PAQUET BOAT d/r cancel and with MARINE POST OFFICE/NZ-R.M.S.MAKURA cds alongside. A nice maritime use. COOK ISLANDS - 1912 1d rate postcard use to UK on Christmas Day. 1912 (DE.25.) use of picture postcard addressed to UK depicting 'Mount Maungatea-Rarotonga' bearing 1d adhesive tied by d/r COOK ISLAND cds. A scarce 'Christmas Day' use. COOK ISLANDS - 1904 inward postcard from New Zealand with COOK ISLAND/RAROTONGA arrival cds. 1904 (SP.10.) 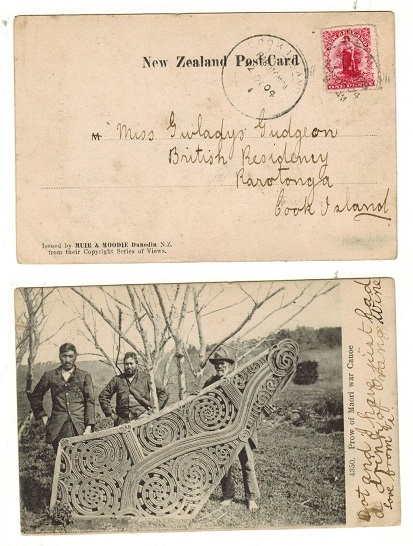 inward picture postcard addressed to the British Residency at Rarotonga depicting 'Prow Of Maori War Canoe' (No.4350) issued by 'Muir & Moodle at Dunedin bearing New Zealand 1d 'Universal' adhesive tied by THAMES cds with COOK ISLAND/RAROTONGA arrival cds at left dated 12.OC.01/1. 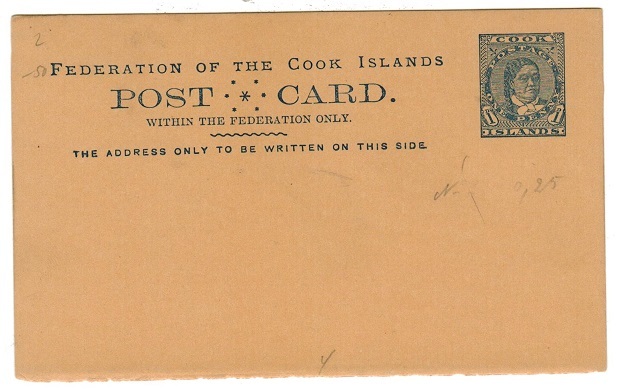 A scarce early inward card to the Cook Islands. 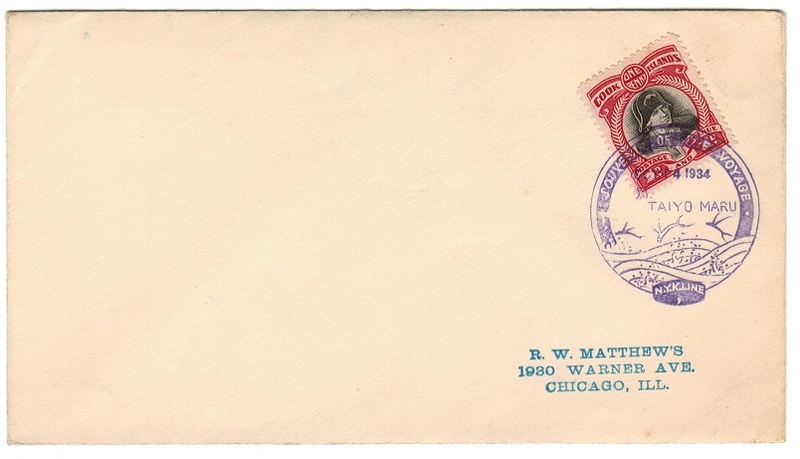 COOK ISLANDS - 1896 2 1/2d rate cover to USA (fault to stamp) used at RAROTONGA. 1896 (FE.27.) 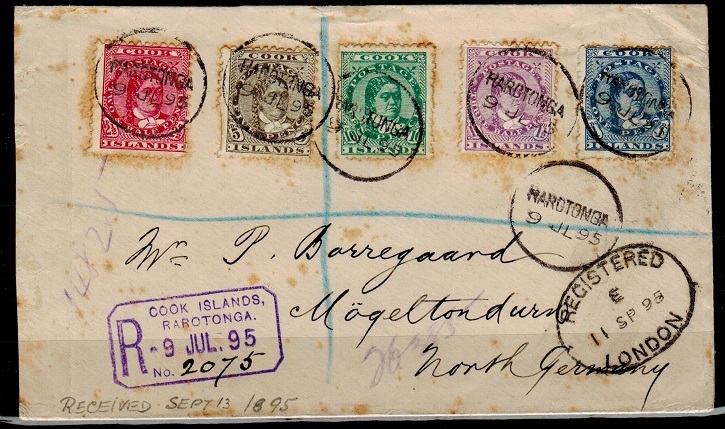 cover addressed to USA bearing 2 1/2d rose (faded a little and corner fault) tied by s/r RAROTONGA cds with a further strike at left. PAPEETE transit b/s. Sent via French Polynesia. COOK ISLANDS - 1944 'RNZAF' first flight cover to New Zealand. 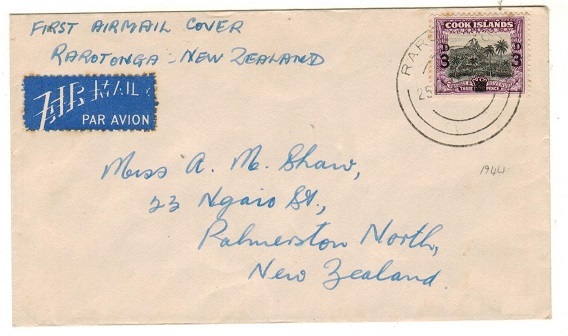 1944 (NO.25) first flight cover to New Zealand bearing 3d / 1 1/2d adhesives (SG 130) tied RAROTONGA. An elusive RNZAF flight. 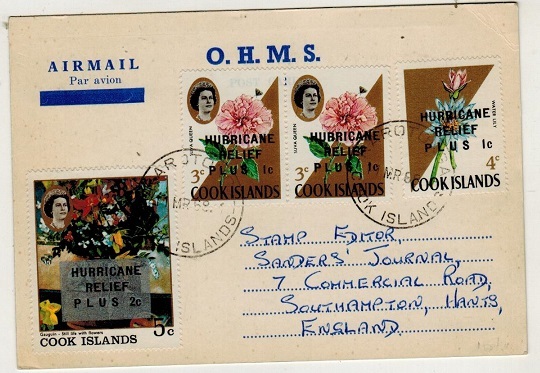 COOK ISLANDS - 1968 use of 'OHMS' postcard to UK with 1c 'Hurricane' overprint stamp use. 1968 (MR.11.) use of blue on cream O.H.M.S. postcard addressed to UK bearing the 1c on 3c (x2) and 1c on 4c HURRICANE RELIEF adhesives (SG 262+3) tied by RAROTONGA/COOK ISLANDS cds's. COOK ISLANDS - 1963 1d IMPERFORATE PLATE PROOF (SG type 45) marginal pair on gummed paper. 1963 1d 'Tiare-Maori' IMPERFORATE PLATE PROOF (SG type 45) marginal pair on gummed paper. COOK ISLANDS - 1963 2d IMPERFORATE PLATE PROOF marginal pair on gummed paper. 1963 2d 'Fishing God' IMPERFORATE PLATE PROOF marginal pair on gummed paper. COOK ISLANDS - 1963 3d IMPERFORATE PLATE PROOF marginal pair on gummed paper. 1963 3d 'Frangipani' IMPERFORATE PLATE PROOF marginal pair on gummed paper. COOK ISLANDS - 1963 1/6d IMPERFORATE PLATE PROOF (SG type 52) marginal pair on gummed paper. 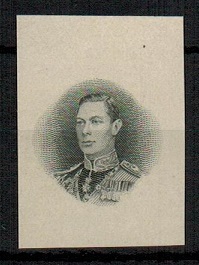 1963 1/6d 'QEII' IMPERFORATE PLATE PROOF (SG type 52) marginal pair on gummed paper. COOK ISLANDS - 1963 3/- IMPERFORATE PLATE PROOF marginal pair on gummed paper. 1963 3/- 'Administration Centre Mangaia' IMPERFORATE PLATE PROOF marginal pair on gummed paper. COOK ISLANDS - 1963 2/- IMPERFORATE PLATE PROOF (SG type 53) pair on gummed paper. 1963 2/- 'Island Scene' IMPERFORATE PLATE PROOF (SG type 53) pair on gummed paper. 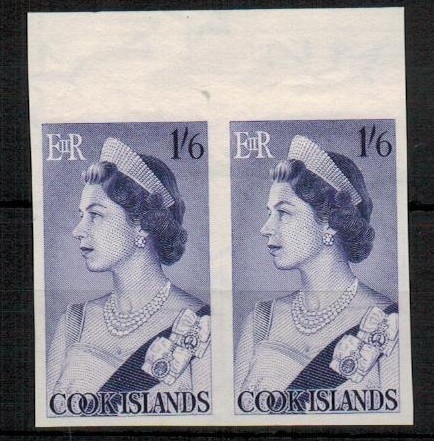 COOK ISLANDS - 1963 5/- IMPERFORATE PLATE PROOF pair on gummed paper. 1963 5/- 'Sailing Ship-RaroTonga' IMPERFORATE PLATE PROOF pair on gummed paper. COOK ISLANDS - 1968 use of OHMS postcard to New Zealand with Hurricane 5c+2c surcharge adhesive. 1968 (MR.11.) use of blue on cream O.H.M.S. 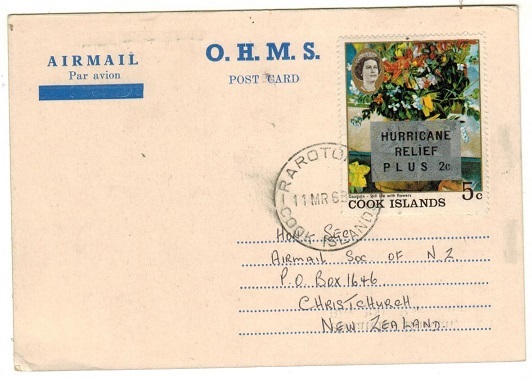 postcard addressed to New Zealand bearing the 5c+2c HURRICANE RELIEF adhesive (SG 264) tied by RAROTONGA/COOK ISLAND cds. COOK ISLANDS - 1947 registered 'Peace' set on cover to UK used at MANIHIKI. 1947 (MY.16.) registered cover to UK bearing the Peace series (SG 146-49) tied by MANIHIKI/NZ cds's. 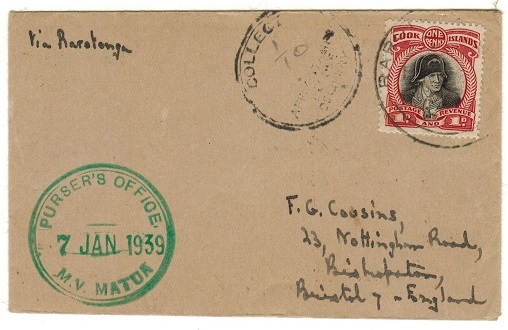 COOK ISLANDS - 1947 registered 'Peace set' on cover to UK used at MANGAIA. 1947 (MY.16.) registered cover to UK bearing the Peace series (SG 146-49) tied by MANGAIA/NZ cds's. 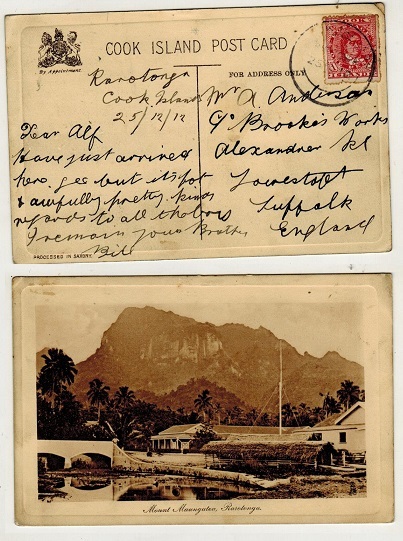 COOK ISLANDS - 1910 (circa) unused postcard depicting Rarotonga. 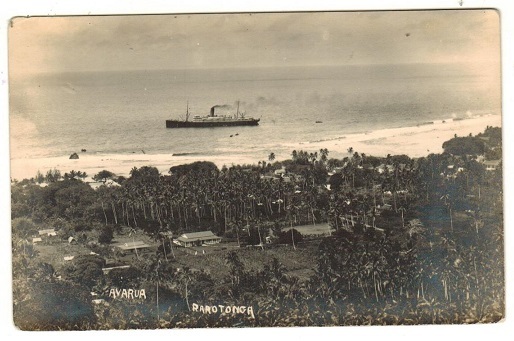 1910 (circa) unused picture postcard depicting 'Rarotonga' and marked 'Avarua'. Early postcards are scarce. 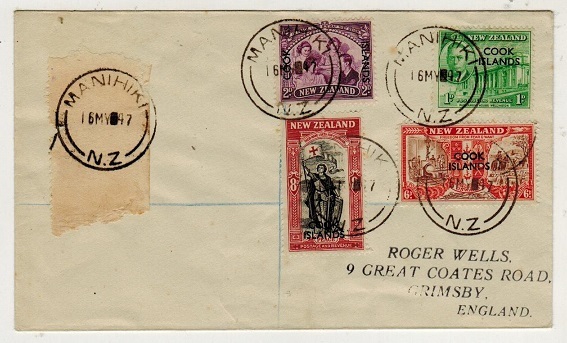 COOK ISLANDS - 1937 range of six covers to UK bearing the 1933 pictorial issue. 1937 (JE.23.) range of six covers bearing the 1933 pictorial series (SG 102-112) arranged on individual covers (one with 1/2d and 1d) each addressed to UK and tied by RAROTONGA cds's. A few very light tone spots here and there otherwise a fine and scarce assembly. 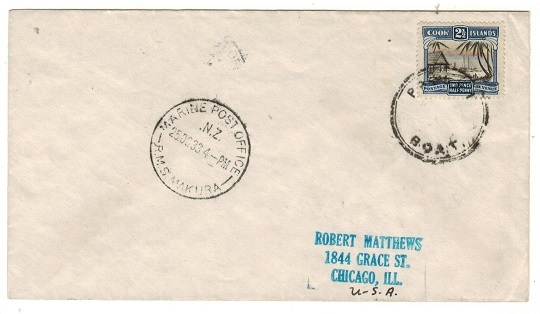 COOK ISLANDS - 1934 1d rate maritime cover to USA used on the TAIYO MARU. 1934 (OCT.14.) cover addressed to USA bearing 1d 'Cook' adhesive tied by superb SOUVENIR OF THE VOYAGE/TAIYO MARU. A scarce Japanese maritime cover of the N.Y.K. Line. 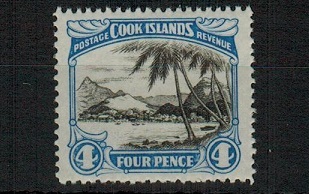 COOK ISLANDS - 1931 2d on 1 1/2d mint block of four with JOINED CE OF PENCE. SG 93. 1931 2d on 1 1/2d black and blue 'red' surcharge adhesive on the scarcer 'no watermark' paper in a very fine mint corner marginal block of four showing the CE OF PENCE JOINED on Row 5/10. (See RL Vol 5/Pg174). SG 93. 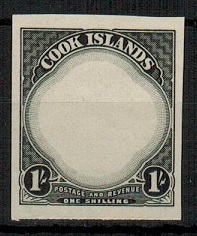 COOK ISLANDS - 1932 2 1/2d black and deep blue U/M. SG 103b. 1932 2 1/2d black and deep blue 'natives working cargo' adhesive in fine unmounted mint condition of the scarcer compound perf 14x13 issue. SG 103b. COOK ISLANDS - 1938 1/- IMPERFORATE PLATE PROOF of the vignette in black. 1938 1/- (SG type 29) IMPERFORATE PLATE PROOF of the frame and value tablet printed in black on cream paper. COOK ISLANDS - 1938 1/- IMPERFORATE PLATE PROOF of the frame in black. 1938 1/- (SG type 29) IMPERFORATE PLATE PROOF of the vignette printed in black on cream paper. COOK ISLANDS - 1938 2/- IMPERFORATE PLATE PROOF of the vignette in black. 1938 2/- (SG type 30) IMPERFORATE PLATE PROOF of the vignette printed in black on cream paper. COOK ISLANDS - 1938 2/- IMPERFORATE PLATE PROOF of the frame in black. 1938 2/- (SG type 30) IMPERFORATE PLATE PROOF of the frame and value tablet printed in black on cream paper. COOK ISLANDS - 1937 4d rate registered cover to NZ used at MANUHUKI. 1937 (JL.28.) 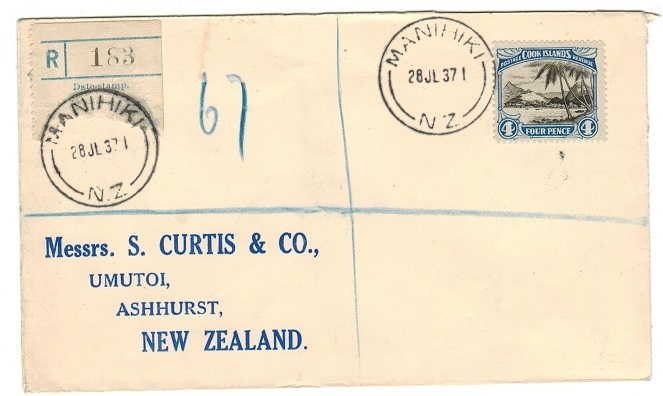 registered cover addressed to New Zealand bearing 4d 'pictorial' adhesive tied by MANIHIKI/NZ cds with blue on cream 'blank' registered label at left similarly struck. 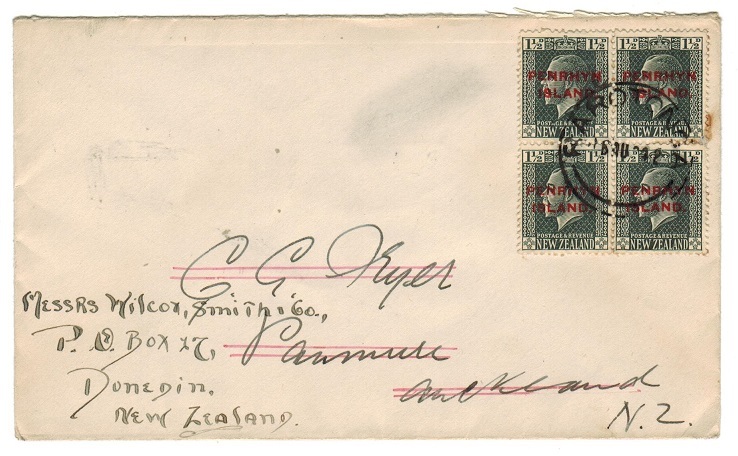 COOK ISLANDS - 1895 registered cover to Germany used at RAROTONGA. 1895 (JL.9.) 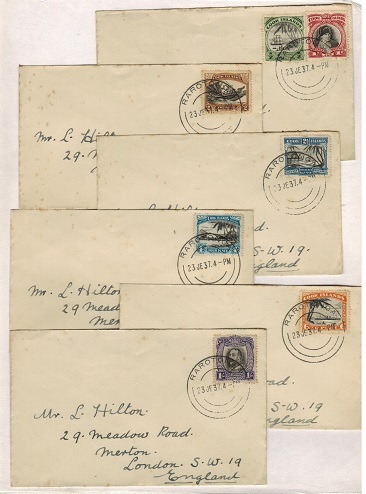 registered cover addressed to Germany (scarce) bearing 1d, 1 1/2d, 2 1/2d, 5d and 10d adhesives (SG 12,14,16,17 and 19) all tied by individual RAROTONGA cancels and with violet boxed R/COOK ISLANDS/RAROTONGA registered h/s at lower left. (Light vertical crease at left edge and some tone spotting mainly around the edges of the stamps from the gum moisture. Complete with a newspaper article of 1972 stating that the NZ Volume 5 handbook covering Cook Islands report only 16 registered covers are recorded between 1897 and 1902. 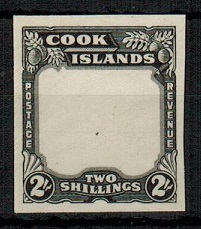 COOK ISLANDS - 1932 1/- (SG type 26) IMPERFORATE PLATE PROOF marginal pair. COOK ISLANDS - 1893 10d DIE PROOF in black. 1893 10d DIE PROOF of the 'Queen Makea Takau' issue (SG type 2) printed in black on thin cream paper. COOK ISLANDS - 1920 1/- IMPERFORATE PLATE PROOF pair printed in issued colours. 1920 1/- IMPERFORATE PLATE PROOF vertical pair (SG type 14) printed in the issued colours of black and violet on ungummed paper. COOK ISLANDS - 1962 OHMS/OFFICIAL PAID pre-printed envelope to Cuba used at RAROTONGA. 1962 (MR.26.) 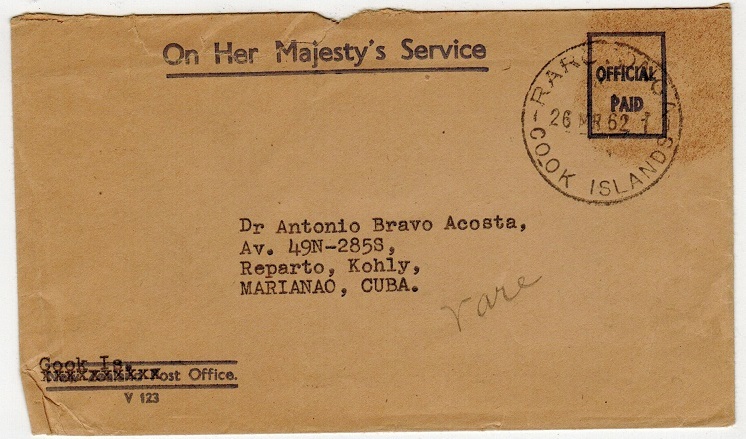 use of stampless O.H.M.S./OFFICIAL PAID envelope addressed to Cuba cancelled by RAROTONGA/COOK ISLAND cds. COOK ISLANDS - 1929 5 1/2d rate registered cover to USA used at MAUKE. 1929 (JE.3.) registered cover addressed to USA bearing 1/2d (x2-one fault), 1d pictorials and 4d 'head' adhesives tied by d/r MAUKE/N-Z cds with blue on cream 'blank' type 'R/81' label struck by violet MAUKE marking. COOK ISLANDS - 1930 R.M.S.MONOWAI maritime cover to USA. 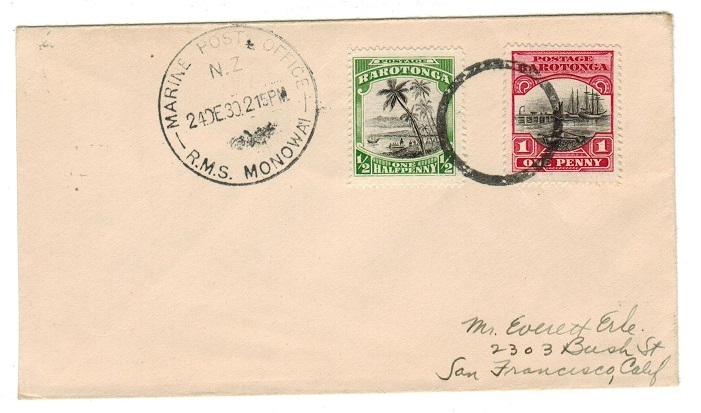 1930 (DE.24) cover to USA bearing 1/2d & 1d adhesives tied by plain circled ring oblitorator (Burge type 48) with MARINE POST OFFICE/NZ/R.M.S.MONOWAI maritime cds alongside. COOK ISLANDS - 1920 (circa) unused postcard depicting 'Avaitu'. 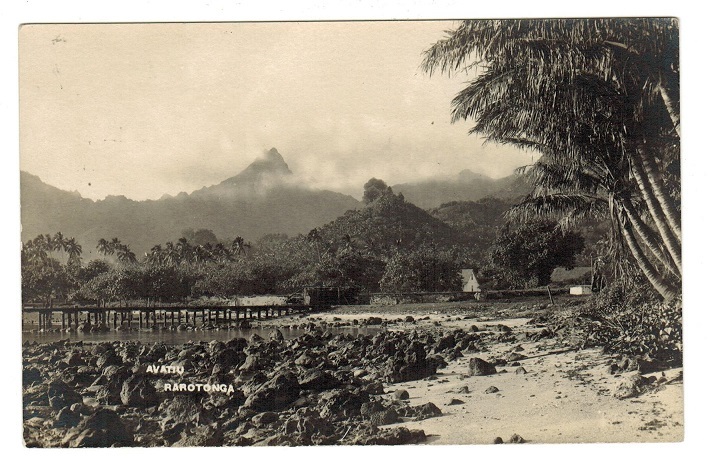 1920's circa real picture postcard in fine unused condition depicting 'Avaitu -Rarotonga' printed by Sydney Hopkins. COOK ISLANDS - 1924-27 IMPERFORATE PLATE PROOF pair of the centre vignette. (SG type 16). 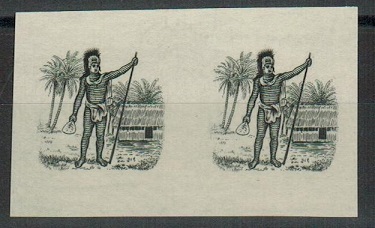 1924-27 IMPERFORATE PLATE PROOF horizontal pair of the vignette only from the 2 1/2d 'Te Po Rarotongan Chief' issue (SG type 16) on ungummed paper. 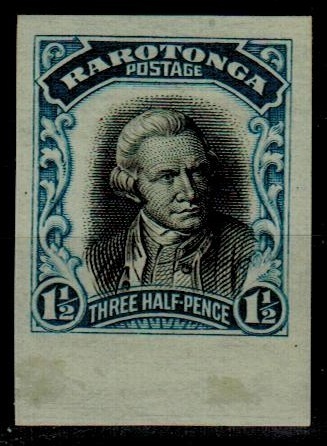 COOK ISLANDS - 1931 3d rate cover to UK used at RAKAHANGA. 1931 (JE.1.) 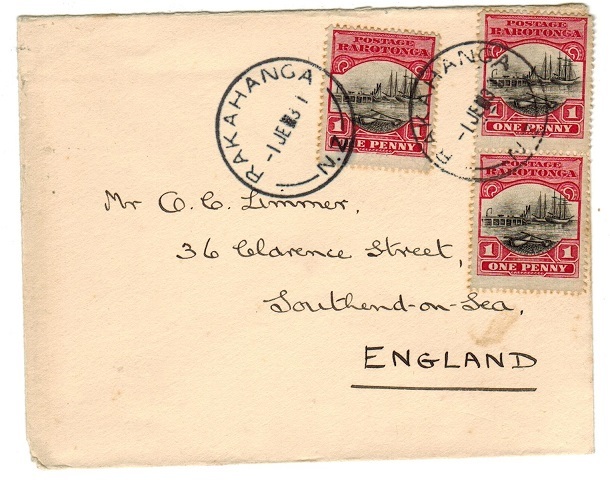 cover addressed to UK bearing 1d (x3) tied by RAKAHANGA/N.Z. cds's. (Collins type G1). COOK ISLANDS - 1924 cover to NZ with PENRYHN 1 1/2d block of 4 used at RAROTONGA. 1924 (AU.16.) 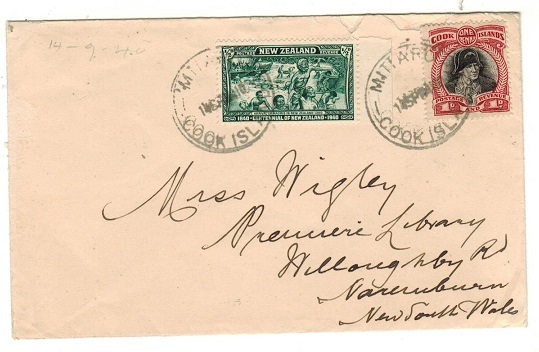 cover addressed to New Zealand then re-directed bearing a block of four of the New Zealand 1 1/2d slate adhesive overprinted PENRYHN ISLAND in red (SG 29) cancelled by complete RAROTONGA cds. Unusual use of these high catalogued stamps of Penrhyn in Cook Islands. COOK ISLANDS - 1920 3d IMPERFORATE PLATE PROOF block of four of (SG type 12). 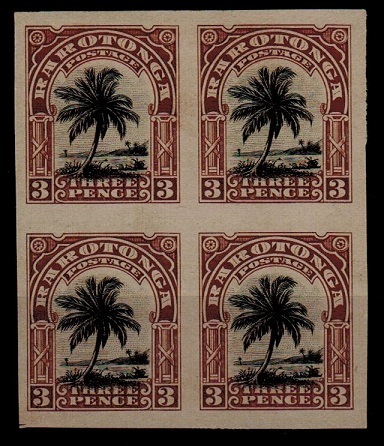 1920 3d IMPERFORATE PLATE PROOF block of four of the 'Palm Tree' adhesive printed in the issued colours of black and chocolate (SG type 12) printed on gummed paper. COOK ISLANDS - 1915 1 1/2d rate cover to UK used at RAROTONGA. 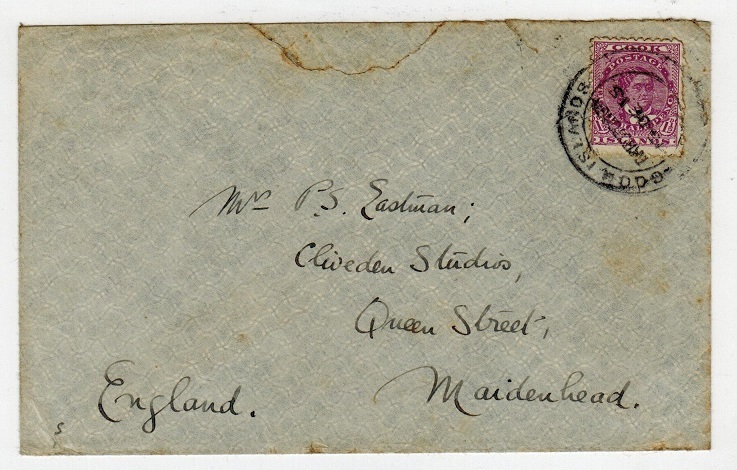 1915 (DE.15) cover to UK bearing 'Queen Makea Takau' 1 1/2d (SG 31) tied by d/r COOK ISLANDS/RAROTONGA cds. 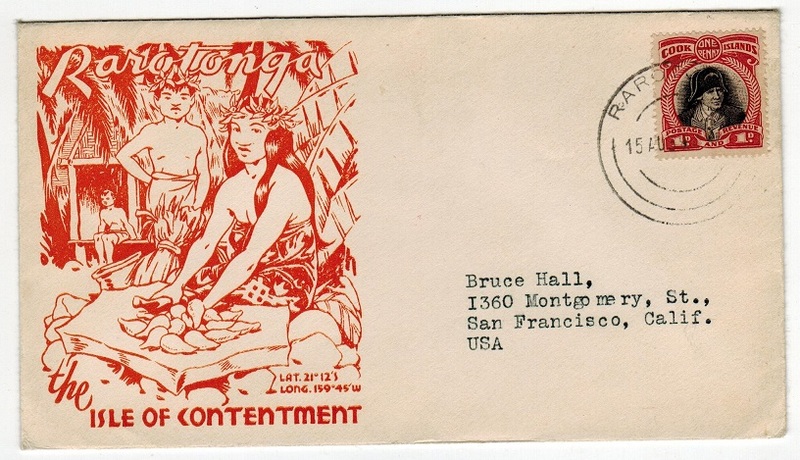 COOK ISLANDS - 1939 illustrated cover to USA used at RAROTONGA. 1939 (AUG.15.) 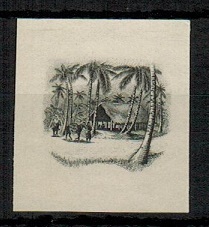 illustrated 'Rarotonga/The Isle Of Contentment' envelope addressed to USA bearing 1d adhesive tied by RAROTONGA cds. COOK ISLANDS - 1941 OFFICIAL PAID h/s on OHMS cover to USA from RAROTONGA. 1941 (MY.26.) use of long manilla pre-printed O.H.M.S. 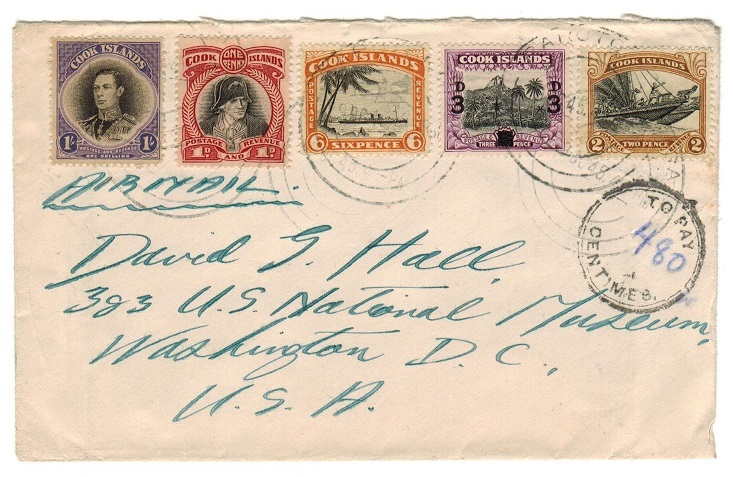 envelope addressed to USA cancelled by RAROTONGA cds with scarce violet ringed OFFICIAL/RAROTONGA/PAID h/s applied. 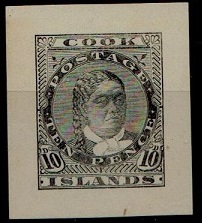 COOK ISLANDS - 1894 1d blue on ochre PSC unused. H&G 2. 1894 1d blue on ochre postal stationery postcard with cut mark at bottom edge. Fine unused. H&G2. 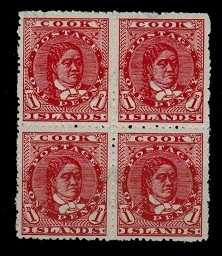 COOK ISLANDS - 1909 1d deep red mint block of four. SG 38a. 1909 1d Deep red (perf 14) in a fine mint block of four with sideways watermark. SG38a. 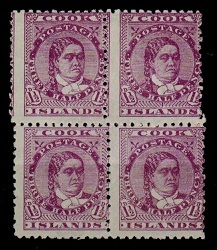 COOK ISLANDS - 1896 1 1/2d deep mauve mint block of four. SG 14a. 1896-1900 1 1/2d Deep mauve (perf 11) in a fine mint block of four. SG14a. 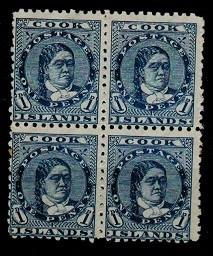 COOK ISLANDS - 1896 1d blue mint block of four. SG 12. 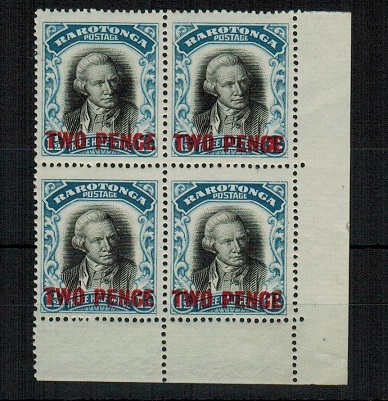 1896-1900 1d Blue (perf 11) in a fine mint block of four. SG12. 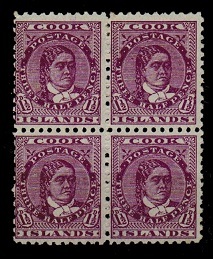 COOK ISLANDS - 1900 6d bright purple mint block of four with INVERTED WATERMARK. SG 18a. 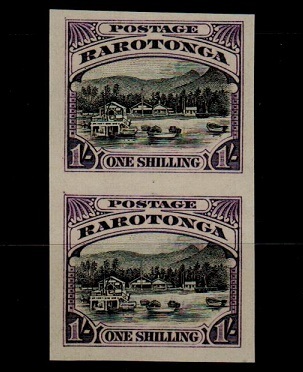 1900 6d Bright purple (perf 11) in a fine mint block of four showing part NEW ZEALAND WATERMARK & with WATERMARK INVERTED. Scarce block. SG18a. 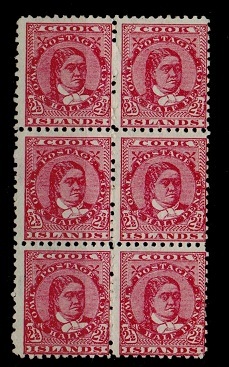 COOK ISLANDS - 1900 2 1/2d deep rose mint block of six. SG 16a. 1900 2 1/2d Deep rose (perf 11) in a fine mint block of six. SG16a. 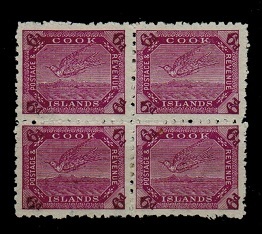 COOK ISLANDS - 1893 1 1/2d mauve mint block of four. SG 7. 1893-1900 1 1/2d mauve (perf 12 x 11 1/2) in a fine mint block of four. SG7. COOK ISLANDS - 1920 6d IMPERFORATE PLATE PROOF pair. 1920 6d IMPERFORATE PLATE PROOF vertical pair (SG type 13) printed in the issued colours of brown and yellow-orange on ungummed paper. COOK ISLANDS - 1920 1 1/2d IMPERFORATE PLATE PROOF. 1920 1 1/2d Black and dull blue IMPERFORATE PLATE PROOF on gummed paper. (SG type 11). COOK ISLANDS - 1893 'Makea' IMPERFORATE PROOF. 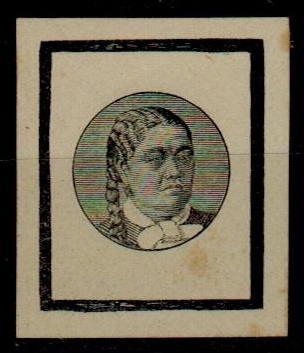 1893-1900 IMPERFORATE PROGRESSIVE PROOF of the 'Makea & Torea' issue queens head printed in black with rectangular frame around on white woved paper. (SG type 2).